Comic-Con is already officially on and one of the boldest moves right out of the gate was Lionsgate’s decision to use opening night to show one of their upcoming movies that doesn’t come out for months. But who can really blame them? Dredd 3D is one of those rare movies that comes to Comic-Con that’s actually based on a real comic book. Word got out of the sneak preview screening pretty quickly with thousands of fans lined-up outside the Reading Gaslamp theater on Wednesday night for a late screening. I’ve been a fan of Judge Dredd since I was a teenager, because it always had such a great concept, that in the future, the judicial system has cut out all the middle men–no police officers, no lawyers, no witnesses–just a judge on a chopper carrying a weapon that can mete out justice based on his own discretion. For everyone who hated the 1995 Sly Stallone Judge Dredd movie, imagine the thoughts of the fans who loved the 2000 AD comics, which was written and drawn by some of the finest British talent. The movie was independently made and picked up by Lionsgate for distribution and there were rumors going around that there were production problems with Travis either quitting or being fired, and anyone who heard about these might automatically assume that the results was a bad movie, and they’d be wrong. 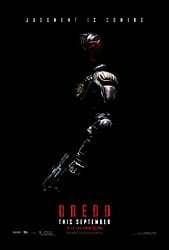 While I was probably too tired after being up for 20 hours to form enough coherent thoughts to write a proper review, I just want to let fans of the character know that it’s pretty clear to me that both screenwriter Alex Garland and director Peter Travis really understood the comics and they really impressed us with his interpretation of Judge Dredd from creating the stark, futuristic environment of Mega City One (in South Africa, of all places) to Dredd’s dialogue and demeanor and even Dredd’s multi-functional voice-controlled weapon. But before all that, the first thing they did right was hire New Zealand actor Karl Urban to play Dredd. Urban appeared in “The Lord of the Rings” movies, The Chronicles of Riddick, RED and took over the role of Chief Medical Officer “Bones” McCoy for J.J. Abrams’ Star Trek and its upcoming sequel. We’re happy to say that Karl Urban really nails the character, delivering just the right scowl and deadpan delivery of lines that might come across a bit silly like “I Am the Law” in a way that would make Dirty Harry himself proud. I was equally surprised seeing indie darling Olivia Thirlby (The Wackness) taking on the role of Dredd’s partner, the psychic Judge Anderson, who is such a terrific character in the comics and Thirlby has just the right balance of fierceness and compassion to pull that off. The general plot involves the seasoned veteran Dredd taking Anderson out on her first day as a rookie judge to evaluate her, and they end up investigating a trio of brutal murders at a 200-story apartment complex run by a psychotic and twisted former judge named Ma-Ma, played by Lena Headey from 300 and “Game of Thrones.” She’s driven the other gangs out to hold a criminal monopoly over the building, and she’ll do anything to protect the empire including closing off the giant bomb shutters that encase the building and putting a bounty on Dredd and Anderson. Comparisons will inevitably be made to the recent Indonesian action movie The Raid due to that aspect of the plot, but other than having cops caught in a building with nowhere to hide from a lot of people trying to kill them, that’s pretty much where the comparisons end. Visually, the film is just stunning, shot by Anthony Dod Mantle who shot Danny Boyle’s 28 Days Later (also written by Garland! ), as he brings a look to the film that’s as distinctive as that one. The film’s most stunning ones are the ones involving the recreational drug Slo-Mo (that Ma-Ma is dealing) which basically slows down time for the taker. While I’m not sure why anyone might want to slow anyone down, the effects of the drug are just amazing to watch with Travis creating these lush slow motion sequences that can be compared to some of the best visuals of Kubrick, Jodorowsky or something out of Darren Aronofosky’s Requiem for a Dream. While at first these beautiful slow motion shots may seem out of place in an action movie, anyone who has seen Zhang Yimou’s martial arts movies (like Hero) knows how beauty can be used amidst violence to create a stark contrast. The score by Paul Leonard-Morgan, who provided a similarly memorable score for Limitless, really does a lot to enhance the entire movie. That’s about all we have to say about Dredd for now. The audience made up of a mix of press and fans seemed to enjoy it quite a bit, but we’ll probably see it a second time before writing a full-on review with rating. Dredd 3D opens nationwide on Friday, September 21. Look for our Comic-Con interview with the film’s star Karl Urban very soon.